I’m happy to start off the week by sharing a fun update on Disney’s Art of Animation Resort. 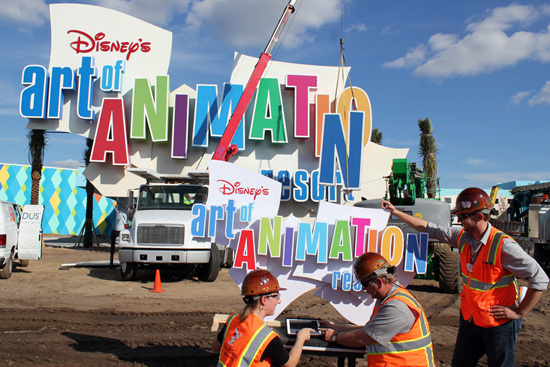 Last week, Walt Disney Imagineering (WDI) put the finishing touches on the new resort’s marquee. Measuring in at 46 feet, six inches, the resort’s sign now holds the record as the largest freestanding marquee at Walt Disney World Resort. (Incidentally, it’s 18 inches taller than the famous “HOLLYWOOD” sign in Los Angeles, Calif.). The photo, supplied by WDI, shows three layers of development the marquee went through in its creation – from digital design, to model, to full-scale installation. Disney’s Art of Animation Resort, which will feature four wings dedicated to popular films Finding Nemo, Cars, The Lion King and The Little Mermaid, will open in phases beginning May 31. Wow, that's really cool looking.